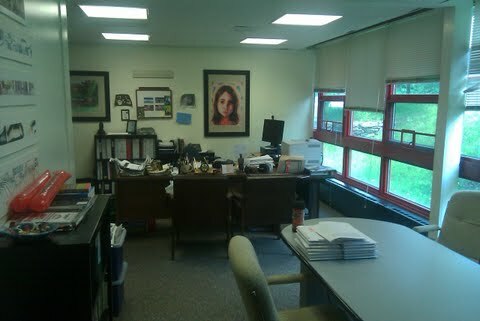 As we continue to look at ways to do things differently, I am thinking about my office. I keep asking myself why I need an office or maybe it's the location that bothers me. I remember hearing a quote a few year's back that stated "the Principal that stays in his/her office may as well stay home." I have to say that I agree with the premise. The best days for me are the ones where I have a lot of interaction with students, teachers, visitors, etc. These interactions do not typically happen in my office. So why do I need an office? Files - I am going paperless as much as possible and file cabinets can be kept in many locations. I would love to hear any other major reasons why I should not give up my office. I am sure that there are a number of better uses for such a large space. With this in mind, I have been spending a lot of time at a desk in the main lobby with my laptop doing the same things that I would have been doing in my office with no interaction with staff and students. So stay tuned for my next post which will be asking for suggestions or proposals for a better use for my office. 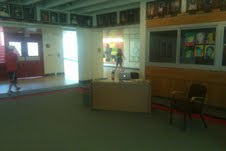 I like the idea of a desk in the main lobby, easy access. However, I do wonder if there is a time that you'd like to work quietly on something in private? I'm taking my first principal job this summer and have had the same thought, how to make myself more accessible to staff, students and visitors. I was thinking along these lines the other day. I was thinking...does a teacher need a desk? If I have a desk in my room I am far more likely to sit at it. Let's try it. You get rid of your office and I will get rid of my desk and we will see if anything changes. Hmmm...... sometimes we need a quiet place / spot in which to retreat during those stressful times in our jobs. This quiet spot needs to possess some special souvenirs such as, pictures of our loved ones (children in particular), achievements, awards, etc which inspire us, give us hope, encourage us to persevere, etc. Our offices can be that special place. Thanks for the feedback! Eric - I wish you well in your new role next year. I continue to remind myself that my best days are when I am out of my office. Therefore, if I do not have an office I think this would resolve that issue. In addition, even though I talk about an open door policy and literally leave my door open all day, I get more feedback from people when I am out in a high traffic area. Chris - I will take that offer. Auction off that desk. I know that there are a lot of newer schools where they have done away with teacher desks as part of the design. As we start to utilize technological tools that are available to us, I believe that the whole idea of time and space will continue to change drastically. Susan - Thanks for your comment. I do need a place to have pictures of my children. The other stuff I am not as concerned about. In regards to having a place to go when I am stressed, I don't have much stress here at BHS and I always feel better when I walk through classrooms to see what is happening. I will continue to develop this thought and see what if any shortcomings are inherent in this move. I gave up the desk in my ELA classroom two years ago. No regrets. All I really need is a spot for my laptop. And wifi. And this is why we love Mr. Larkin at BHS! You were in the lobby the other day and I assumed you were taking a turn as a hall monitor. I had no idea this was your new office. Could there be a better spot to see the "comings & goings" at BHS? Mr. Larkin, you have taken accessibility to a whole new level. It's a great idea. I doubt there is a more enthusiastic principal anywhere! You have address many of the practical issues that immediately came to mind and so I am struggling to find a reason. However, allow me to offer this: Is there a symbolic reason to have an office? 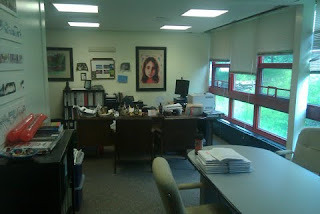 Does a school "need" a Principal's Office - a command post if you will? I'm not sure I buy into it, but I thought I would throw it out to see others' thoughts. Many, many innovative companies have done away with "walls" per se. Instead they have common work areas to promote collaboration among team members. I liken what you are doing to promoting collaboration between the school leadership and the school. By moving to a central location you are more attuned to the happenings of the building. I look forward to hearing more about your office w/o walls. Brilliant! I Love the idea, but maybe you need a private place to call home, just incase. As mentioned in previous posts...the conference room would be a suitable location. Coincidentally,I too have contemplated aborting my desk. It is a clutter collector and in my earlier days of teaching I never had one nor did I need one. Now that I'm "older" I find myself at it more and more. Good luck! I am conflicted about your current dilemma. I agree that a principal should be "out and about" as much as possible. But on the other hand, you need a home base and I do not think a conference room would be a good place - not very personal. Maybe the size of your office is the issue. Wasted space? What about changing things around, making the current conference room your office and your office, which is bigger, the conference room to allow for bigger groups? As a current high school principal, I think it is important to be careful that you are not getting caught solving matters that could be solved by others. Accessibility is great, but be careful that you don't become the highest paid secretary, clerk, or security guard. Your role as the CEO of learning is first. This is a great idea, just be careful. Late to the discussion ... the idea of making yourself visiable is key. I agree! For me I get energy by being out with the students and staff. I also know I need a time to meet with parents to have difficult conversations. I have to be able to take difficult phone calls behind closed doors. Having my office allows me a place where I can schedule all of this. My secretary will tell you I'm difficult to catch in my room and she's gotten use to me not in the office. But having my office there she is able to leave material, messages or whatever that I can find on my arrivals to the office from time to time. All this said, I also know we as principals need to be careful that we don't get cornered in our office. If we aren't careful a few minutes can turn into hours behind the desk.